We are a leading Exporter of finger protector splint, frog finger splint, finger cot, finger extension splint, arch support pair and foot in sole pair from Delhi, India. With the aim of delivering qualitative products, we are engaged in offering our clients with an excellent quality Finger Protector Splint. This is used to fix patient with vacuum negative pressure, avoid second injury on patient when transferring. There are handles along each edge of this stretcher, safe and steady, can be used to transfer patient by two persons or several persons. We are one of the noticeable providers of a quality grade array of Frog Finger Splint for our valued clients. The offered splints protect and immobilize the phalanges in case of fractures, injuries or post-operative care. Moreover, one can get these products at leading market price. Our offered product is highly demanded in the market for their effective usage in hospitals and clinics. 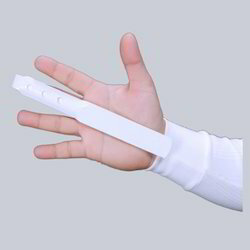 Being a well-established organization, we are offering a qualitative range of Finger Extension Splint. Offered extension splint is designed by our experts using high quality polyethylene foam in tandem with the complete compliance with the set quality norms. This extension splint is obtainable in small, medium and large sizes. Perfect support the foot contains a unique props that are equipped with cushioned pads and an elastic strap that keeps supporting the right spot on the leg. The support is made of antibacterial impregnated fabric, which helps to prevent foot odor. Package includes one pair of support feet Strutz Comfort. We are the Manufacturer, supplier & Exporter of Foot In Sole Pair. With consistent focus on our quality, our company is engaged in offering a wide spectrum of Heel Cusion Pair. The offered cushion gel pad is manufactured using the best quality basic material and modern technology in line with industry norms. 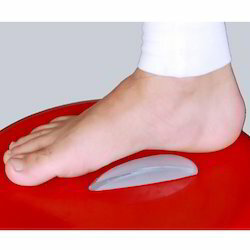 Our offered cushion gel pad is used to provide utmost comfort to the heels. In addition, this cushion gel pad is available to the clients in various sizes and specifications.